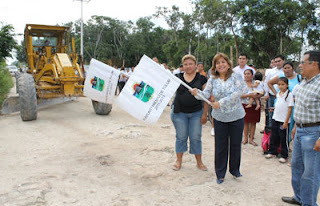 In support of the neediest areas of the municipal of Tulum, Mayor Edith Mendoza Pino, gave the green light to the start of earthworks that will benefit colony of Veleta. The colony Veleta is one of the colonies most marginalized in recent years because it was inhabited without any order. This left a signifcant job Mayor Mendoza Edith Pino, who is concerned about the security and the access of vehicles and public transportation to the colony. The project work consists of 5,700 square feet of dirt on South 18th Street and 10th Street south of the colony. With a reported investment of 855 thousand dollars that will benefit their people. The municipal president said, "This investment is intended to increase the access of vehicles such as public transport and private-public security patrols in the colony.¨ He also noted that this work benefits the colony and has made works in other colonies of the city, however this area is one of the most marginalized by other administrations and has a considerable delay, "That's why we're working hard to give balance to its inhabitants, compared with those living in other neighborhoods that already have all their services, " He said.